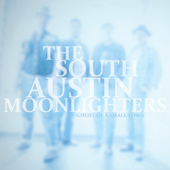 Another big thing from Austin TX: THE SOUTH AUSTIN MOONLIGHTERS return full force with Ghost Of A Small Town! The Blue Rose label has always had a strong affinity for Texas-style roots, country and Americana rock! After the Resentments, the Band of Heathens, Deadman and Shurman, the South Austin Moonlighters are another hopeful signing in a string of excellent bands from the Texan capital. Over the years the South Austin Moonlighters – S.A.M. to their fans – have acquired a home state reputation as a formidable live act that made its way to the European scene after their very promising debut album Burn & Shine was released two years ago. The quartet is now delivering on this promise big time with Ghost Of A Small Town. Four excellent musicians, all of them songwriters and lead singers, have made what is possibly the most mature, varied and interesting genre album of 2016 so far – not only in Austin! Texas music rocks! The story of the band starts in March 2011 when Lonnie Trevino Jr., Phil Bass, Josh Zee and Phil Hurley – four experienced professional musicians – became friends at the Sin City showcase during the yearly SXSW music festival. Soon they started hatching plans to get together outside of their other bands & projects Mother Truckers/Whiskey Sisters, Deadman and Stonehoney. Soon this loose pet project became a tight unit with concrete plans. They developed a repertoire, started booking gigs and writing songs. As early as SXSW 2012 talent scouts started taking note. After a privately released live CD (from the Saxon Pub, of course), Blue Rose released their studio debut in early 2014. With its stylistic variety, strong songs and great performances Burn & Shine was a great success and a statement of Texamericana Rock for this time! Guitarist, singer & songwriter Phil Hurley hails originally from Boston and moved to Austin in the last decade. On the East Coast he enjoyed moderate sccess with the Gigolo Aunts, an 80s & 90s college/guitar/rock/pop group, before playing a great mix of Westcoast & Texas, Eagles & Alt.Country with Stonehoney. The singing & songwriting drummer Phil Bass has been in business for over 30 years touring with Monte Montgomery, recording with Mark Jungers and Houston Marchman and being a member Whiskey Sisters, a female-fronted band that grew out of Mother Truckers. This is where he met guitarist/singer Josh Zee and bassist/singer Lonnie Trevino jr. Trevino used to play with Monte Montgomery and blues guitarist Mike Zito, joined Austin cult band Deadman, toured with Fastball and Whiskey Sisters. Josh Zee has in the meantime been replaced by Chris Beall, a real all-round talent who has released two solo albums. He leaves his stamp on the S.A.M. sound with his strong voice and attractive guitar interplay with Hurley -and he also engineered the new album. Ghost Of A Small Town is a step forward for S.A.M. with its great sequence, natural and clear sound and a great balance of mature songs and rocking arrangements on 13 tracks. Fans of Little Feat, Los Lobos, Beat Farmers, John Fogerty, John Mellencamp, Flying Burrito Brothers and Arc Angels will enjoy the album very much! Chris Beall’s and Phil Hurley’s contributions are dominated by fat guitars, beautifully nostalgic 70s vocal harmonies and hooks. Right out of the gate, Beall’s „A Year Of Decembers“ is a competent rocker, a little later there’s the power ballad „Suburban Avenue“ and „Fallin‘ Down“ with strong echoes of the Band Of Heathens‘ country rock sound. Hurley shines on the Eagle-esque „Movin‘ On“ and the restrained folk-pop/rock of „Final Line“. „You, Love & Me“ – a co-write with Shurman’s Aaron Beavers -is an upbeat country rock song with gliding guitars, beautiful harmonies and a killer hook – made for riding down the highway! Bassist Lonnie Trevino Jr. provides the groove- and rhythm-oriented numbers. Not unlike The Resentments‘ Bruce Hughes, Trevino brings some funk, driving bass riffs and catchy lead vocals to „I’ll Be Coming Home“ and „Lookin‘ For A Lover“ with its JJ Grey & Mofro-related Southern groove. His „So Far Away“ is clearly one of the album’s hottest rock numbers and would fit right into the Wood Brothers‘ catalogue. While Trevino is a remarkable shouter, Phil Bass play great polyrhythmic drums and Hurley & Beall duel on electric blues rock guitars. Singing drummer Phil Bass delivers some black & swampy elements. „(Lyin‘ On The Bottom) Mississippi River“ is drenched in blues and Southern soul. He also sings on the band-composed „Hold On“, a jam-and-groove-oriented number that can go up to ten or 15 minutes long on stage, and on the album’s sole cover, the traditional gospel blues „Jesus (Make Up My Dying Bed)“ which was performed in the early 19th century by Blind Willie Johnson, Charlie Patton and Josh White before Bob Dylan, Led Zeppelin and others reinterpreted it later. S.A.M. are giving it a 7-minute version with delicate, meandering guitars (including slide & lap steel) and a call & response vocal jam. This is great southern Americana, only followed by the album’s title track. „Ghost Of A Small Town“ is a 68-seconds short instrumental that ends this big album. Kommentare deaktiviert für Another big thing from Austin TX: THE SOUTH AUSTIN MOONLIGHTERS return full force with Ghost Of A Small Town! The Big Show was yesterday, today is A World Without – new album by STEPHEN SIMMONS!